We want our students to have an education at FGCS that yields deep understanding and that fosters a love of learning. Like all public schools, FGCS follows state standards, but we offer a curriculum that places learning in a meaningful context, recognizes that students learn in different ways at different rates and encourages students to take responsibility for their own education. 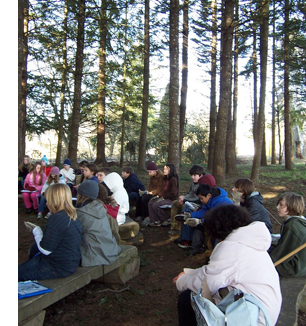 At FGCS, our students engage in education for sustainability through hands-on, project-based curriculum. In addition, our school models sustainable practices throughout our operation. The combination of sustainability focused curriculum and operations steeps students in a culture of mindfulness and care for our future. FGCS students acquire the skills and motivation needed to participate in the civic life of their local and global communities through our culture of student voice and involvement through projects with community partners. Citizenship also encompasses care for one another within our school community as well as in the broader community.